I absolutely adore Emile Zola. When you praise a 19th century author, it’s the fashion to say that they were modern and ahead of their time. But what I love about Zola is that he’s not modern. He writes the sort of work that doesn’t exist anymore. And, thus, reading him provides an absolutely unique experience. Zola’s work is as much sociology as fiction. His thing was that he was going to exhaustively catalogue every aspect of life in the Second Empire (the reign of Napoleon III, from 1851 to 1870). And then he did it, in twenty novels that all follow different members of the same extended family, the Rougon-Macquarts. To date, I’ve read about 8 of these novels. They all have the same basic plot: a person desperately wants something and struggles to achieve it. About a third of the way through the novel, they seem like they’re almost getting it. Then something bad happens and it slips away. Then they work even harder and about two thirds of the way through the novel, it feels like they’re going to come close to achieving a result that is, if not quite what they want, then at least pretty darn good. And then in the last third of the novel, everything goes to hell and they descend into madness, despair, and death. What makes his novels work is that he writes books about people that no one writes about (which is why the few of his novels that do tackle the aristocracy and upper-class society usually remain unread, since those books have been written in much better form by people like Proust and Balzac). 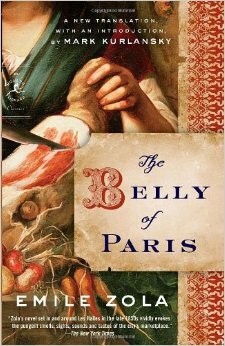 In The Belly of Paris, which I just finished reading, all of the drama centers on the feud between two women, one of whom owns a charcuterie and the other of whom owns a fishmonger’s stall. These two women, who are basically competing to see who can be the queen bee of Les Halles (the Paris food markets), tear their entire community apart with their rivalry. It’s so intoxicating to read an author who’s willing to seriously treat with the emotional life of working-class people (in this case, the main agonists are lower-bourgeois shopkeepers, but all of the rest of the characters are fairly poor). Even today, that’s a really rare thing. When was the last time you read a book about someone who owns a grocery store? And to think that you’re reading about working class people who (would have) lived 150 years ago? That’s amazing! Anyway, this was a really good one. Not the best Zola I’ve read, but certainly in the top four. The best, I think, would be L’Assommoir (which is about alcoholism) and then perhaps Germinal (which is about a labor strike in a mining town) and The Masterpiece (which is basically about the early Impressionist painters). However, I don’t think I’ve read a single Zola novel that I didn’t enjoy. I actually own three more: The Lady’s Paradise (about a clothing store); The Kill (about stock-traders); and The Restless House (about an apartment building).